As a child growing up in New Hampshire and having for a mother an old-school liberal Democrat, an active selfless party volunteer, I developed early on a fascination for American political life. The city of Concord, where I attended high school, was the nerve central of the presidential primary campaigns which rolled into town every four years, bringing with them the obligatory discharges of hot air, free canapés, and air-brushed, glad-handing candidates. I shook JFK’s hand the night before he won the New Hampshire primary in 1960, and the first vote I ever cast was for the maverick Eugene McCarthy, whose 1968 campaign ultimately signaled the resignation of Lyndon Johnson and the slow winding down of the Vietnam War. So it was somewhat of a natural fit when the topic of Richard Nixon, Mao Tse-tung, capitalism, and communism should be proposed to me as the subject for an opera. The idea was that of the stage director Peter Sellars, whom I’d met–in New Hampshire, fittingly enough–in the summer of 1983. I was slow to realize the brilliance of his idea, however. By 1983 Nixon had become the stuff of bad, predictable comedy routines, and it was difficult to untangle my own personal animosity–he’d tried to send me to Vietnam–from the larger historical picture. But when the poet Alice Goodman agreed to write a verse libretto in couplets, the project suddenly took on an wonderfully complex guise, part epic, part satire, part a parody of political posturing, and part serious examination of historical, philosophical, and even gender issues. All of this centered on six extraordinary personalities: the Nixons, Chairman Mao and Chiang Ch’ing (a.k.a. Madame Mao), Chou En-lai, and Henry Kissinger. Was this not something, both in the sense of story and characterization, that only grand opera could treat? Nixon in China took two full years to complete. Throughout the composing I felt like I was pregnant with the royal heir, so great was the attention focussed on it by the media and the musical community at large. The closer I came to completing the score, the more apparent it became that there would be no sneaking this opera out discreetly in workshop. As it turned out, an unstaged sing-through with piano accompaniment done in San Francisco five months before the actual premiere attracted critics from twelve national newspapers and was even mentioned (and sardonically dismissed) by Tom Brokaw on the NBC Nightly News. To my mind Alice Goodman’s poem is to me one of the great as-yet-unrecognized works of America theater. Her words are a summary, an incantation of the American experience, and her Richard Nixon is our presidential Everyman: banal, bathetic, sentimental, paranoid. Yet she does not deny him an attempt, albeit couched in homely metaphors of space travel and good business practice, to articulate a vision of American life. Adrienne Lobel’s set for the original Sellars production took its cue from Communist Chinese iconography. Reds, blues and greens were bright and unmodulated, imparting the look and feel of old propanada literature from the Cultural Revolution. The arrival of the Nixon delegation in Act I, a coup du theatre worthy of Aida (which incidentally was playing in Houston concurrently with Nixon) featured an immense replica of Air Force One, the Presidential 747 from which Nixon, Pat and Kissinger descend to be greeted by a long line of identically clad Chinese officials. The second act ballet, “The Red Detachment of Women”, a study in agitprop dance, theater and music, was based on a political ballet from the period of the Cultural Revolution that had been shaped and ideologically massaged by Madame Mao. Mark Morris’s choreograpy featured the same absurd images of ballet dancers on point, dressed in the uniforms of the People’s Revolutionary Army and brandishing rifles. In composing for this scene I set for myself the equally absurd goal of making it sound as if it were the creation of a committee of composers, none of whom were sure of what the other was doing. This followed the line of the tradition of creating “people’s” art. Nixon’s 1972 trip was in fact an epochal event, one whose magnitude is hard to imagine from our present perspective, and it was perfect for Peter Sellars’s dramatic imagination. Nixon in China was for the sure the first opera ever to use a staged “media event” as the basis for its dramatic structure. Even at his young age in 1987, Peter showed a deep understanding for the way in which people in power managed to keep themselves there. He understood brilliantly how dictatorships on the right and on the left throughout the century had carefully managed public opinion through a form of public theater and the cultivation of “persona” in the political arena. 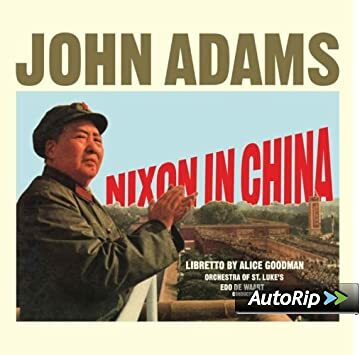 Both Nixon and Mao were adept manipulators of public opinion, and the second scene of Act I, the famous meeting between Mao and Nixon, brings these two complex figures together face to face in a dialogue that oscillates between philosophical sparring and political one-upsmanship. Recorded by the original cast with the Orchestra of Saint Luke’s conducted by Edo de Waart on Nonesuch 79177.